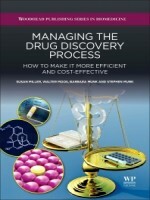 Managing the Drug Discovery Process: How to Make It More Efficient and Cost-Effective thoroughly examines the current state of pharmaceutical research and development by providing chemistry-based perspectives on biomedical research, drug hunting and innovation. The book also considers the interplay of stakeholders, consumers, and the drug firm with attendant factors, including those that are technical, legal, economic, demographic, political, social, ecological, and infrastructural. Since drug research can be a high-risk, high-payoff industry, it is important to researchers to effectively and strategically manage the drug discovery process. This book takes a closer look at increasing pre-approval costs for new drugs and examines not only why these increases occur, but also how they can be overcome to ensure a robust pharmacoeconomic future. Written in an engaging manner and including memorable insights, this book is aimed at redirecting the drug discovery process to make it more efficient and cost-effective in order to achieve the goal of saving countless more lives through science. A valuable and compelling resource, this is a must-read for all students and researchers in academia and the pharmaceutical industry.